Pastelillos are almost bar food. They’re good at family get togethers, poolside and right now while we’re watching the World Cup. They’re all kinds of stuffings sweet and savory for these little pies. They can be made cocktail size or larger to stand in as breakfast or lunch on the fly. Just about all cultures have these. My niece, Elizabeth, just left a day or two ago for Delhi working on a 6 month project. She’ll find some spectacular hand pies there such as spicy curried potato pies, curried lamb and curried lentil. I made for this lazy, Sunday afternoon guava and cheese hand pies. They’re deep-fried, easy and delicious. Here’s the hook. The dough is already made, rolled out and cut into perfect rounds. All you have to do is stuff them and drop them into a waiting pan of hot oil. The guava paste can be purchased at the grocery store. It’s a gorgeous, deep garnet color, sticky and firm. It will melt in the pie while frying. Cream cheese is great in the pie as well as “queso fresco”, a crumbly, salty white cheese. It’s a savory-sweet match made in heaven. One day soon I will post a recipe for the meat filling, picadillo. Truly. I promise. Meantime, I’m dropping these bad boys in hot fat and rooting for Greece. Pame Ellada! Well, as we all know now Greece did not make it. These hand pies are perfect to drown your sorrows. That and a tall, stiff drink. They’re perfect for an impromptu get together because they’re easy and totally unexpected. 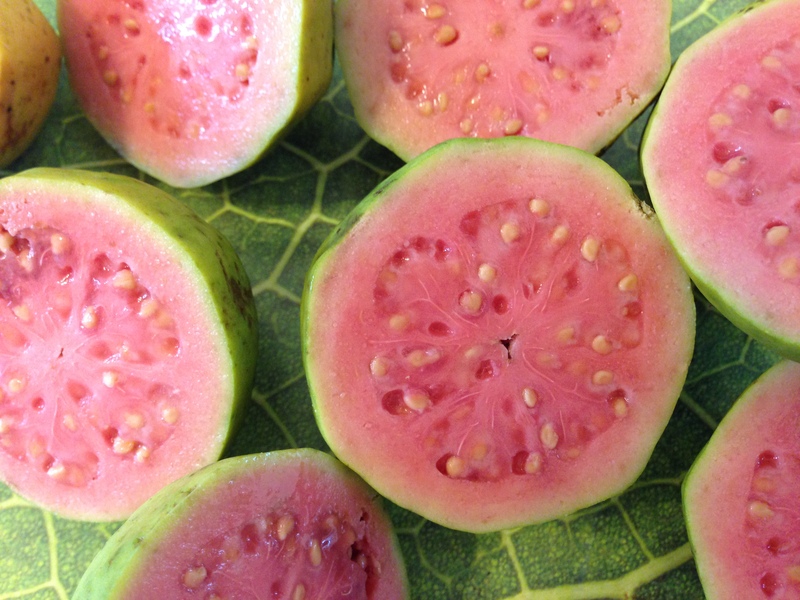 The sweet-salty mix goes well with all manner of drinks and people think guava’s so exotic. And quite frankly, it is! Back to the dough. The pastelillo rounds are in the Hispanic frozen food section of your grocery store. They come 10 to a package and should be defrosted in the refrigerator otherwise they can get a little soggy. Goya makes them as well as some other companies. Try to find guava paste in the tin; I find it to have the most flavor. 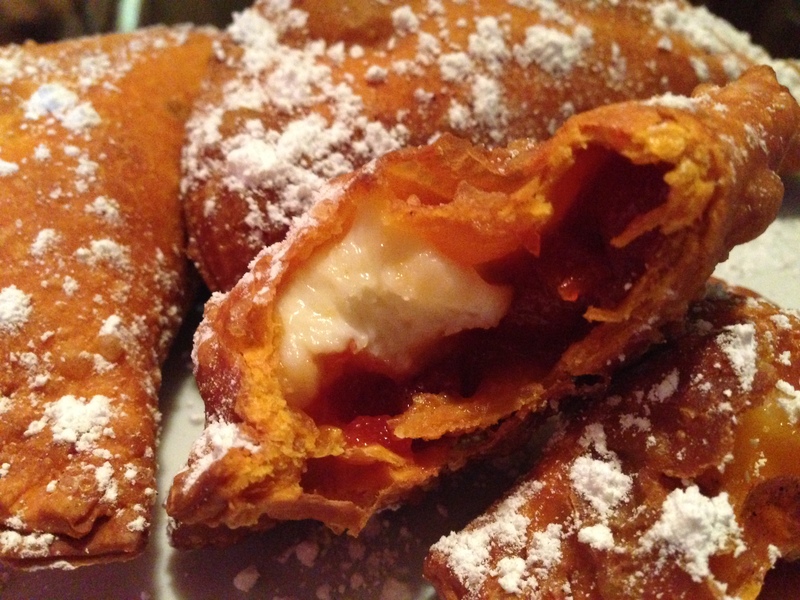 The outside of the fried pastelillos will look blistered and puffed up when finished. Oh! And let them cool a bit after draining on paper towels. The hot guava paste is like molten lava in your mouth! Buen provecho! Place one dough round on your work surface, dip your finger or a pastry brush into the egg and lightly paint the egg wash on the edge of just one half of the dough. Onto one half of the dough round place a tablespoon of both guava paste and cream cheese or cheese of your choice. For cocktail size use half the amount cheese and guava. Fold the pastelillo in half. Using a fork press the edges together to form a tight seal. If there are any holes in the dough makes sure they are pinched closed because if the paste or cheese leaks out into your pan you’re going to have a great, big mess. Repeat with all the rounds until finished and set aside. In a large frying pan heat about 2-3 inches of oil to 350° or medium high. Add the stuffed pastelillos being careful not to crowd the pan. Fry on each side 2-3 minutes or until each side is golden. Sprinkle with confectioner’s sugar to make them look pretty. Cucumber Gin Fizz…Party at Chapel Thrill!